However a university in Victoria has demonstrated that including impact exercise like jumping or skipping should be included in a treatment protocol. This, alongside proper nutrition and supplementation reduces the risk of fractures by enhancing muscle strength and power as well as improving function. Muscle power refers to the body’s ability to produce fast and forceful movements and is critical to optimising balance, mobility and reaction time, all of which are important to reduce the risk of falls and fractures. In 2013 Deakin University’s Centre for Physical Activity and Nutrition Research, developed Osteo-cise: Strong Bones for Life, an exercise program for over-60s that extended the standard mobility, strength and balance exercise ordinarily associated with older-age fitness. The Osteo-cise program included power training, along with bone-strengthening movements like step-ups and mini jumps. “Bones need the loading that comes from impact exercises like jumping, hopping and skipping – this is why walking alone isn’t enough to improve bone strength,” says Dr Jenny Gianoudis, one of the study’s leaders. The program followed 162 men and women aged 60 years and over. Half took part in the program, the other half only received information about osteoporosis. Both groups received vitamin D and calcium supplements. After 12 months the researchers determined that those who took part in the Osteo-cise program in combination with supplements of calcium and vitamin D had significantly improved their bone density, muscle power, strength and balance. One way to one way to maintain muscle power and strength is with moderate to high-intensity resistance training performed quickly – lifting or pushing a weight as fast as you can rather than using a slow, controlled movement. This form of exercise teaches muscles to contract quickly under load. Osteo-cise has been developed to do exactly that. Owing to these results, the Deakin researchers hope that Osteo-cise programs will soon be rolled out in a number of gyms. Emed has previously explored the the importance of smart supplementation in cases of osteoporosis. You can read more about this here. Below are some points on key nutrients. Extra calcium from either food or supplements produces only small (1 to 2 per cent) increases in bone mineral density. According to a study published in The British Medical Journal in September 2015 noted that this amount is unlikely to mean much reduction in fracture risk. However rather than thinking ‘well why bother?” even a slight increase in calcium intake may help raise a person’s bone density above the fracture threshold, Professor Caryl Nowson, of Deakin University’s School of Exercise and Nutrition Sciences, notes. Magnesium is a mineral that plays an important role in the maintenance of healthy bones. Magnesium contributes to increased bone density and helps to prevent the onset of osteoporosis. Vitamin K1 and K2 (phylloquinone and menaquinone respectively) is produced by bacteria in the intestines. The bacteria will normally produce all the Vitamin K that the body requires, however antibiotic use, alcohol, poor diet and sickness can kill these Vitamin-K producing bacteria. A lack of the good bacteria in the intestines will not only lead to poor health and gastrointestinal problems, it will also lead to a dietary deficiency in Vitamin K.
Consequently everybody should be using a good quality probiotic supplement everyday. Not only will this replenish the ‘good bacteria’ in the gastrointestinal tract, it will also promote good digestion, vitamin and mineral absorption, and optimal health. Phosphorus, potassium, boron, zinc and copper play a part in maintaining bone integrity. A good quality calcium supplement should contain these trace minerals. What is less spoken about is that more than 30 per cent of bone is composed of protein. In older people an increase in dietary protein combined with progressive strength training can increase the body’s muscle mass. More muscle is associated with higher bone mass. Minerals are deposited in a protein matrix within the bone. If there is insufficient dietary protein, the body cannot maintain this protein matrix. The Health Equations Blood Test Evaluation has demonstrated for years that protein deficiency is as significant a factor in osteoporosis as is calcium deficiency. Sources of protein include vegetable sources such as legumes (e.g. lentils, kidney beans), soya products (e.g. tofu and tempeh), grains, nuts and seeds. Also include smaller amounts of lean red meats, poultry and fish, eggs and some dairy foods such as cheese and yoghurt. There are many contentious articles and studies that state that animal protein being a causative factor in osteoporosis. The belief is that when we consume animal protein such as beef, pork, lamb, chicken, or other foods derived from animals such as dairy, our bodies take in sulphur as well as protein. This sulphur is not present in the vegetable based proteins in plant foods—fruits, vegetables, nuts, grains, or legumes like peas or dry beans. As we digest animal proteins, the sulphur forms an acidic environment causing a slight, temporary acid overload (acidosis). To regain our natural balance of acidity to alkalinity in the bloodstream, our bodies buffer the influx of acid. One possible buffer is calcium phosphate, which the body can take from its main storage location – our bones. Though calcium phosphate is an effective buffer and neutraliser, by it being taken from our bones, the theory is that it might increase our risk of osteoporosis. Click here to read more about Acid/Alkaline and pH Balancing. Smart supplementation is essential when addressing osteoporosis. Equally important is precise and targeted exercise designed to maximise results. The Deakin University Osteo-cise: Strong Bones for Life exercise program appears to be one such program that all people over 60 should be employing. 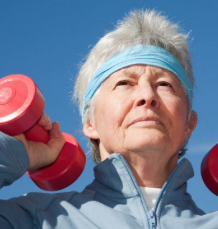 By improving muscle strength and power, individuals can improve bone density, muscle power, strength and balance and reduce the risk of falls and fractures.